Shelves of glass products line the factory at La Verrerie de Biot in the village of Biot in the Provence, France in Europe. 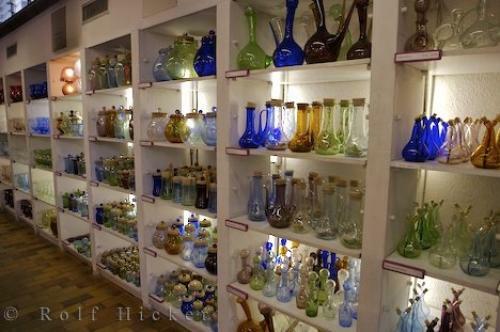 Photo of a selection of handmade glass products in the village of Biot in the Provence, France. ... Tours are available to view professionals create glass products and observe each step in the process of glass making.Glass products on display at La Verrerie de Biot in the town of Biot in Provence, Cote d'Azur, France, Europe. I photographed this photo with the digital SLR camera model Canon EOS-1Ds Mark II, aperture of f/4.0, exposure time of 1/80 sec. on ISO 400, as always I used a original Canon Lens, the focus lenght for this picture was 24mm.